Archie was born with a glint in his eye that immediately set him apart from his elder brother. He was calm, wide eyed and curious and whilst he may be a lot less calm at two and a half, he still has the same bright eyes and that desperation to see everything. At two and a half he is a typical toddler in many ways. He wants to learn everything using all of his senses, he doesn't understand his limits and high up is a challenge rather than out of bounds. He will argue with you all day that he is actually four and 'big enough' for whatever you tell him he can't have and he is learning at a rate so fast I can barely keep up. I love this age, I love his developing sense of humour, the 'shows' he puts on to delay bedtime each night and the way he expresses himself. I love that he is starting to assert his independance but he is also still a baby, needing more cuddles and physical contact than either of his other brothers. Archie is struggling with Dylan being at school. He isn't happy to leave him at the gates and he is so excited when he collect him. I hear their little conversations as they talk about how they missed each other and declare that they are still best friends. This picture sums up Archie at the moment. I told him that he needed his wellies on to go in the puddle - he thought otherwise. Once he had run through it once, there seemed no point stopping him, and I spent the next few minutes watching him in his element, running through, jumping, stomping and splashing. He ended up soaking wet to his waist with a huge grin on his face all afternoon. 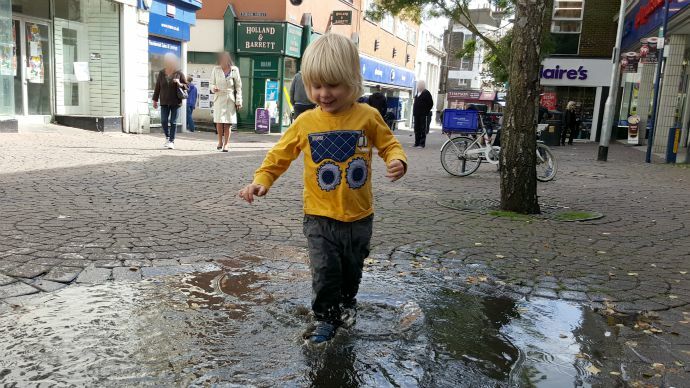 My wild child loves getting wet and his Goretex shoes are perfect (although not even wellies would have protected him from this puddle!). They keep his feet dry and protected during his everyday adventures. The Surround technology means 360 degree breathability so that moisture can escape from both above and underneath - perfect after splashing in puddles! My wild child is growing up, he is getting taller, stronger and more curious by the day. He plays hard, he loves hard and I love getting to be part of his adventures. Oh he reminds me so much of Elma - there's no stopping her when it comes to puddles either! And yay for a good puddle, even if he did get a bit damp!! Our little adventurers! I bet they would be trouble together!